Following Thursday’s news that U.S. Attorney General Jeff Sessions would rescind the Obama-era policies of non-interference with marijuana-friendly state laws, Colorado Republican Senator Cory Garder immediately spoke out in defiance. 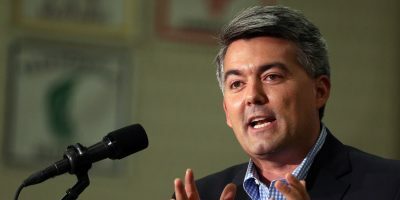 A torrent of praise for the Senator ensued, perhaps most notably in a Washington Post piece that heralded Gardner as a model Senator when it comes to standing up to President Trump. But Gardner routinely tricks the media into taking him at his word, basking in the glow of favorable headlines after sticking up for politically popular policies before he promptly resumes doing absolutely nothing to serve as a check on Trump, whom he has voted with 95 percent of the time. You may remember that Gardner was also quick to respond to the news that the Trump administration would end the Deferred Action for Childhood Arrivals (DACA) program, which allowed undocumented immigrants who were brought to the country as children to continue living, working, and attending school in the United States without the threat of deportation. Gardner immediately threw support behind the DREAM Act, which would permanently shield DACA recipients from deportation and lay out a path to citizenship. But four months have since transpired since the lives of nearly 800,000 DACA recipients were plunged into chaos and uncertainty, and the DREAM Act, which bears Gardner’s name, hasn’t come any closer to consideration on the Senate floor. Gardner also cosponsored legislation to reauthorize the Children’s Health Insurance Program (CHIP), yet has done nothing to advance that legislation, which has languished for months in the Senate while Gardner and his Republican congressional cohorts have poured their energy into passing highly unpopular tax legislation. Meanwhile, nearly nine million children are at risk of losing insurance, including 75,000 in Colorado, one of the first states where funding will run out. Alabama’s CHIP program narrowly avoided a freeze in enrollment that was slated to go into effect on the first of the year after a short-term funding measure was passed by Congress just before the holidays, but that extra funding is only estimated to last three or four weeks. Will Gardner soon allow Colorado’s CHIP program to be placed on life support as well? It’s worth reemphasizing here that as the head of the National Republican Senatorial Committee, Gardner is one of the most influential members of the Senate – and yet he has decided not to use that influence to hasten the process of passing funding for CHIP or putting the DREAM Act to a vote. And in vowing to hold up Department of Justice nominees unless Sessions ensures the safety of Colorado’s booming cannabis industry, Gardner has shown that he does, in fact, have the capability to leverage his position to assert the will of his constituents on the national stage. So what was stopping him from wielding that power when the lives of young immigrants or the health of the nation’s children were called into question? It is, of course, important to give credit where credit is due, but the media is too quick to forget about Gardner’s unkept promises while heralding his most recent attempt to appear as a knight in shining armor. Only when Gardner makes good on his word should he be given credit.